WASHINGTON— In response to a petition by the Center for Biological Diversity, Center for Food Safety, Xerces Society and renowned monarch scientist Dr. Lincoln Brower, the U.S. Fish and Wildlife Service said today that Endangered Species Act protection may be warranted for monarch butterflies. The agency will now conduct a one-year status review on monarchs, which have declined by 90 percent in the past 20 years. “The Endangered Species Act is the most powerful tool available to save North America’s monarchs, so I’m really happy that these amazing butterflies are a step closer to the protection they so desperately need,” said Tierra Curry, a senior scientist at the Center for Biological Diversity. Monarch butterflies are known for their spectacular multigenerational migration each year from Mexico to Canada and back. Found throughout the United States during the summer months, in winter most monarchs from east of the Rockies converge in the mountains of central Mexico, where they form tight clusters on just a few acres of trees. 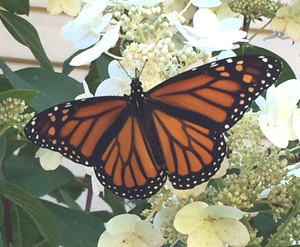 Most monarchs west of the Rockies migrate to trees along the California coast to overwinter.